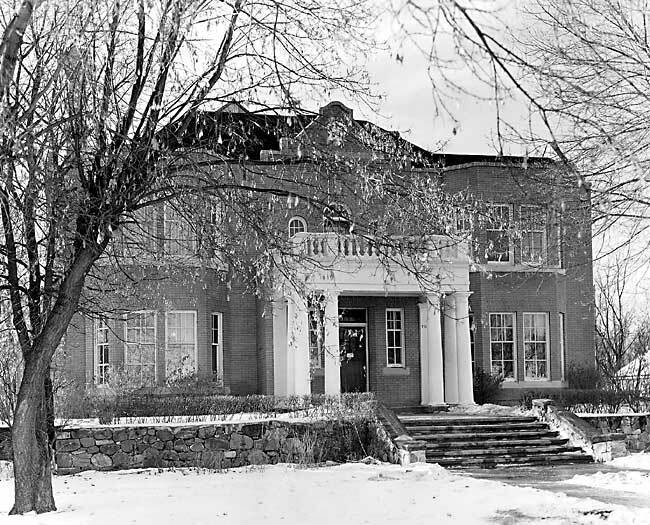 Among the casualties of the University's expansion into North Garneau the one most likely to be lamented by generations of Alberta alumni will be the Rutherford House, which has stood near the corner of 112th Street and Saskatchewan Drive since 1911. 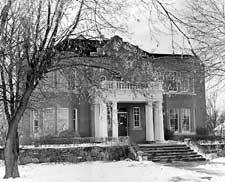 Built by the first Premier of Alberta, the Honorable Alexander Cameron Rutherford, the substantial old brick house, with its pillared porch and stone-walled terrace, was occupied by the Rutherfords until 1940. Since then it has been the home of the Alberta chapter of Delta Upsilon fraternity. Dr. Rutherford ranks with Dr. Henry Marshall Tory chief among the founders of the University of Alberta. As Premier and Minister of Education he pressed for the earliest possible establishment of a provincial university. His administration was responsible for the first University Act and for the choice of the site on the North Saskatchewan in the western part of what was then the city of Strathcona. Above all he persuaded Henry Marshall Tory to become the first President. His interest in the University did not lessen with his retirement as Premier. He became Chancellor of the University in 1927 and remained in that office until his death in 1941. Closely related to his devotion to the welfare of the University was Dr. Rutherford's interest in history and particularly in the history of the Canadian West. He was an enthusiastic collector of Canadiana especially of material related to the Canadian West. His collection, which threatened to overflow even the spacious limits of his house, became one of the most important in the west. He was extremely generous in opening it to those who shared his interests and communicated his enthusiasm to many students. The collection was presented to the University of Alberta through the generosity of his heirs and remains the basis of its holdings in the field of early Canadian and western history. Dr. Rutherford was one of the founders of the Historical Society of Alberta in 1907, which had among its charter members the whole body of the Legislative Assembly of the Province. He remained an active and interested member throughout his life and was its President from 1919 to 1941. Dr. Rutherford played a leading part not only in politics and education but also in the affairs of his community and his church. There can, however, be no doubt that his deepest and most abiding preoccupation was with the university. It was natural that he should build his house within sight of the campus. He followed its development with the closest interest and its students and faculty were the beneficiaries of the warm hospitality extended to them by Dr. Rutherford and his wife, the former Mattie Burkett of Ottawa. Until his death in 1941, almost every graduate of the university must have been entertained at least once at their house. Their annual Founder's Day tea party was a gracious and refreshingly personal aspect of the ceremonies attending the annual graduation exercises. The Rutherford House is an outstanding example of the more opulent domestic architecture of the Canadian West at the time of emergence from the pioneer stage. As befitted the prospective residence of a man as prominent as Dr. Rutherford in the public life of his province, it was a large and substantial building planned for entertaining on a large scale. When it was built the use of brick for domestic building was the exception to the general rule, though most of the larger houses built in Edmonton at this time were constructed of this material. Many of these, especially in the downtown area, have disappeared, or are about to disappear. In the early years of the century the fashionable quarter of Edmonton, and what was then called "the West End", was the part of the city lying west of 101st Street, east of the present C.P.R. tracks and between Jasper Avenue and the edge of the river valley. Further west lay an area which included the homestead taken by Father Lacombe and the extensive property of Malcolm Groat. This may still be identified by the large number of Roman Catholic institutions, St. Joachim's Church, Grandin School, the General and Misericordia Hospitals, for example, that were established here. Malcolm Groat was a generous benefactor both to the Roman Catholic and Anglican churches. Both these areas contain many examples of the residential architecture of this period, but these are rapidly disappearing as sites are cleared for the construction of high-rise offices and apartment buildings. In the pre-1914 period when the Rutherford House was built, the movement westward had been stimulated by the construction of Government House, the only major stone residential house in Edmonton. Most of the houses in the ravine area west of 124th Street and south of Stony Plain Road are, however, of later construction. On the south side of the North Saskatchewan river in the town and city of Strathcona with which the Rutherfords were particularly identified, were Whyte Avenue (82nd Avenue) and Main Street (104th Street). Main Street, north of Whyte Avenue, and the adjoining parts of Saskatchewan Drive, were especially desirable residentially speaking, and a number of large houses, including that occupied by the Rutherfords until 1911 (9715104th Street) were built in the vicinity by Strathcona magnates. In this area, as in the old "West End" of Edmonton, high-rise apartments are beginning to replace older housing. In North Garneau, the area between 109th Street and 112th Street and between 87th Avenue and Saskatchewan Drive, most of the houses are smaller and of slightly later construction though the choice of the university site in this vicinity made this a desirable residential area. The exceptions in point of size are the Rutherford House, a few houses more or less contemporary with it and close to it, though not on the Drive, and the Allin and Crang residences on 111th Street, 8820 111th Street and 8808 111th Street. All these are in the area which will be taken over for university purposes. The Rutherford House is in style eclectic, though the use of a deep red brick and of white wood trim is reminiscent of much Georgian domestic architecture. Some of the detail, especially of the windows, suggests a Palladian influence. The main facade has a central porch flanked by two large bay windows. The most notable feature is the pillared porch which protects the main entrance and commands a fine view northward of the river valley. The porch rises from a terrace supported by a low stone wall, and originally was approached by a circular carriage sweep. The interior is obviously planned for entertaining. The small vestibule is a natural concession to the Alberta climate and the northward aspect of the house. The entrance hall is large, with an impressive central staircase. The hall was intended to be lit partly from above by a colored glass skylight, still intact but now covered by a protective bulkhead. On the left is the library, wood panelled like the hall, with a fireplace containing an electric heater, placed there to keep the books dry. Behind the library is a large dining room with a bay window and behind that the kitchen, which has been much altered. On the right of the hall is the living room, the term used by the Rutherfords, and behind that a small sitting-room ("the den") with an open fireplace and a double inglenook. Behind that again is another small room used as a breakfast room. The southwest corner of the house has what was originally an open porch, later converted into a conservatory or sun-room. This is entered from the small sitting-room. The second floor has been considerably altered. The most interesting feature here is the treatment of the upstairs hall, which is extended to the front of the house to form an upstairs sitting-room with a fine view over the river valley. The panelling here has been substantially preserved. The bedrooms have been refinished with plywood panelling but no major structural changes have been made. The third or attic floor was used by the Rutherfords for storage. It is at present in use as a dormitory and has not been altered. Light from this attic room was borrowed for the halls below through the colored glass skylight referred to above. The basement has been extensively altered by the fraternity but no major changes have been made. It was used by the Rutherford family purely for utility purposes. The grounds were originally quite extensive, amounting to about 1 acres and lying north of Saskatchewan Drive and east of 112th Street. The residence at 9117112th Street was built to the south of the Rutherford House in 1924 by Mr. S. H. McCuaig, a son-in-law of Dr. Rutherford. Other houses were built on the original grounds after the sale of the property in 1940. A feature of the grounds which was once a familiar landmark to generations of university students was a rustic summerhouse in the northwest corner of the grounds, long a popular retreat of courting couples. Though sketches of the summer house may remain the structure has disappeared, as has the use of the term "twittering", obsolete as far as the present generation of students is concerned. The circular carriage sweep has been altered but the stone wall built of rock brought from Mill Creek and the steps up to the terrace remain, as do some of the original trees, notably a number of large Manitoba maples. An interesting feature of the grounds is the brick-built garage behind the house. Dr. Rutherford was an early convert to the automobile and the house was thus built with a garage rather than the stables and carriage house which would have been appropriate a few years earlier. The garage originally had a grease pit and storage tank for gasoline. For many years it housed a large red Packard, which is believed still to be in existence. Some of the original furniture survives. Some of it remains in the house, together with some of Dr. Rutherford's beloved books, and the members of Delta Upsilon have been remarkably careful custodians. The furniture was largely of the period contemporary with the construction of the house and affords a good example of the taste of the time. With the assistance of Mrs. S. H. McCuaig and others inventories of the contents of the various rooms have been drawn up. The rarer volumes from Dr. Rutherford's collection are in the University library and others are in storage. It has been suggested that the University should, as a memorial to its founder, preserve and restore the house as far as possible to its original condition in 1911, with as much as possible of its original furnishings. It would not be difficult to supplement these with furniture of similar character and the result would be a unique example of the taste and the way of life of Alberta more than half a century ago. Such a building, apart from its intrinsic interest, could find various uses and would be of especial importance for teaching purposes to university departments like Fine Arts, History and Household Economics. The University authorities have however, with regret, found it impossible to make an exception in the case of the Rutherford House and it is, like the other houses of North Garneau, a residential quarter unique in Edmonton, soon to become no more than a memory, its site marked, if possible, by a suitable plaque.